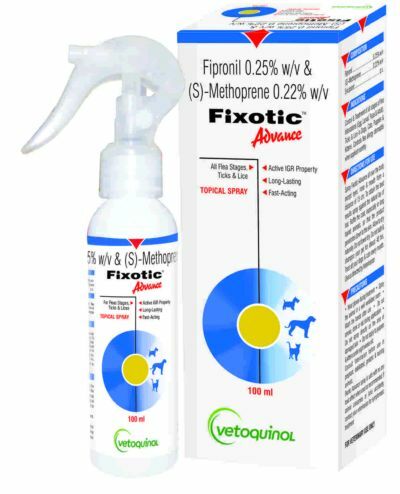 Fixotic Advance is effective for the prevention & control of ectoparasites i.e. Ticks, Fleas & chewing Lice in dogs & cats. Easy application and fast absortion on pets skin. Preferably bath the pet 1 day before application of fixotic. Shake it well & spray it against the direction of hair except eyes, nose & mouth from a distance of 15 cm. Let the animal be air dried. If needed, massage for proper distribution. Wear hand gloves. Use as directed by veterinarian.